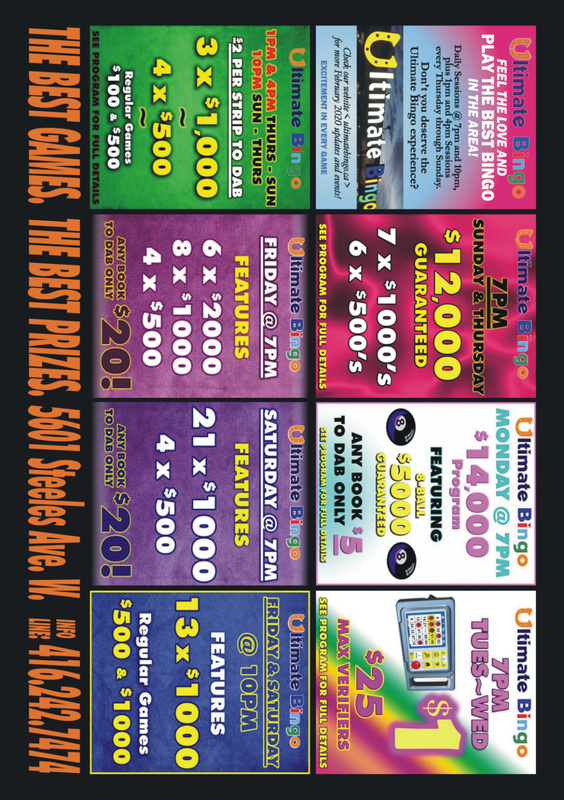 ADDRESS 5601 Steeles Avenue W.
CHECK OUT THE NEW ULTIMATE BINGO PROMOTIONAL VIDEOS AS YOU SCROLL DOWN! CHECK OUT THIS STORY FROM THE TORONTO SUN REGARDING THE RECENT $100,001 MONSTER BINGO FINAL JACKPOT WINNER, MELANIE MOREL! *** If you are viewing this page on Internet Explorer and just see a white square above, CLICK HERE TO VIEW THE “WHERE HISTORY IS MADE” VIDEO ON YOUTUBE. *** If you are viewing this page on Internet Explorer and just see a white square above, CLICK HERE TO VIEW THE “WHO WANTS IT” VIDEO ON YOUTUBE. CLICK HERE TO CHECK OUT A GREAT STORY ABOUT THIS HISTORIC, MONSTER BINGO FEATURED IN THE TORONTO SUN! *** If you are viewing this page on Internet Explorer and just see a white square above, CLICK HERE TO VIEW THE “MONSTER BINGO HIGHLIGHTS” VIDEO ON YOUTUBE. CLICK HERE TO TAKE A VIRTUAL TOUR INSIDE ULTIMATE BINGO!